By Israa`eel, February 13, 2012 in Islamic hOt ContEstS! Who was the first ever racist? Ok, i think this one was a bit too easy. Yes the answer is Shaytaan; and the reason is given by correctly in the above reply - Shaytaan was made of fire and Aadam [as] was made from earth, hence shaytaan thought he was better. Interesting tidbit: In biology there is no such thing as 'race' in the human species (though it does exist in some animal species) because the genetic differences between humans of one so-called 'race' are greater within the so-called race than they are between the so-called races. Also because all human beings can be genetically traced back to one relatively recent female ancestor (yes, science accepts that we all descended from a single woman) there hasn't been enough time for big enough differences to develop. So, really we should be trying to do away with the concept of race altogether. That's not an answer of a Muslim. There is nothing to add here by 'thinking'. The first evil doer according to Islam is Satan. The answer has been already given above with clear explanation. It's usually the non-Muslims who say something like this instead of saying Satan. Also, jealousy is not a being. Racism is an evolutionary trait. It has been around for millennium, right down to the first few humans (well, not as in Adam and Eve but the first humans as determined by fossils and the visible transition from Neanderthals to us). You can see it in animals today. 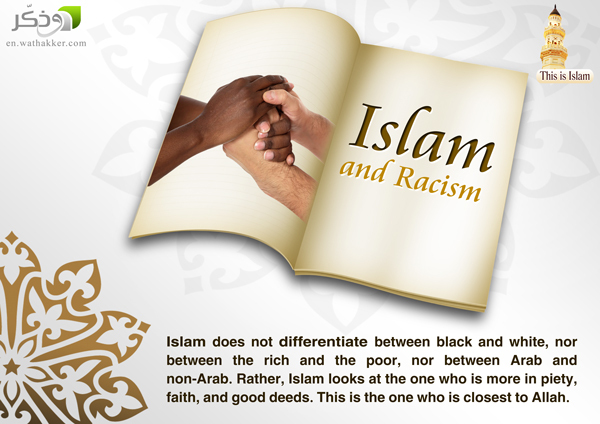 Anti-racism or even simple neutrality is much rarer and is exclusive to our race. The psychology of rejecting pariahs is very interesting indeed. Islam fires the seed of racism in uk. If we dropped the religion and discussed like rational people ie - not talking of beings made of fire. Then we could overcome the colour of skin. If someone could mention an Islamic charity in the uk that doesnt specificlly cater to muslims, id be very happy to hear about it. Iblees was the first racist. I don't know if there was racism among jinn already before the incident with Iblees and Adam. Among humans, the first racist was probably Fir'awn, maybe Namrud? Good God! Are you actually saying that Muslims should not think for themselves, but should simply accept Islamic teaching and Islamic faith without question? That's scary indeed! Go To Topic Listing Islamic hOt ContEstS!